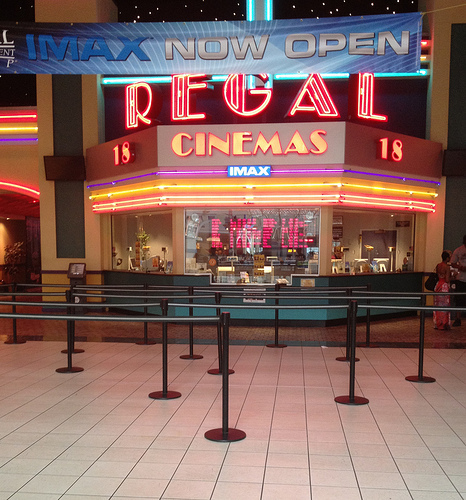 At the end of this month, May 2013, Regal Cinemas plans to introduce and distribute a new closed-captioning device for the deaf in over 6,000 different Regal Cinemas theatres all over the U.S.
instead. Basically, the glasses seem to project the captions about 10 feet in front of the user; but these captions are not seen by anyone else in the theatre, so they are not distracting. These glasses also come with an audio track option that describes what action is happening on the screen for the blind. Additionally, there is also a simple option just to boost the sound from the movie for the elderly or those hard of hearing. This is big news for those who are visually or audibly impaired. Many of these disabled people have been unable to enjoy simply pleasures in life, such as going to the movie, productively. It is hard to find screenings of movies that are captioned for the impaired. Also, the current captioning devices that are sparsely available are highly impractical; though they fit in the seats cup holder, the screen is bulky and obtrusive, is distracting to other paying viewers, and is out of the range of sight to the screen for the impaired viewer, making the device more inconvenient that anything else. The CEO of Regal Cinemas, Randy Smith Jr., has been working on a solution to this problem for over 10 years with some personal motivation. His son Ryan, who is 23 years old, is deaf. Technology companies have been sending Randy and Ryan prototypes of potential devices to allow the deaf and blind to thoroughly enjoy a movie without imposing on the other paying viewers. Ryan was used as their “guinea pig” and would provide feedback of positive and negative aspects of the different devices until, finally, over a decade later, both Randy and Ryan were satisfied with a final product. This final product is what is going to be released to the public at the end of the month. Not only is this important for the disabled persons themselves, but also their parents and loved ones who have always wanted to enjoy the simple things in life, such as a movie, with their child or spouse.